I popped into Endeavour House this afternoon to check on my in-box. It is sometimes just a repository of what seems to be junk mail. So it was with no expectation of being enthused that I opened a brown envelope and saw the Annual Report of Suffolk Artlink. Suffolk Artlink works to improve the quality of life of people of all abilities through taking part in engaging and inspirational activities. So far so ho hum. 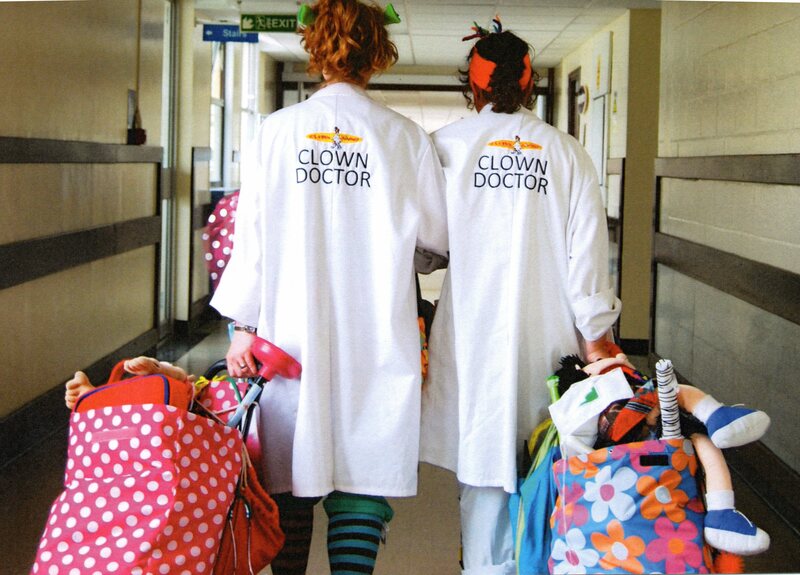 But before looking for a bin I flipped it open at pages 18 & 19 to see this project which engages children and young people in hospitals and hospices in clowning, storytelling, music, magic, circus skills and improvisation helping to distract them from what can be a very difficult time. If any picture can be worth a thousand words – this is it. Please enjoy and think of the artists who do this work (Dr. Fillie Fidget (Filomena Cristallino, Dr Christobell Misschief (Chris Draude) and Dr. Hyacinth Haystack (Vicki Weitz).